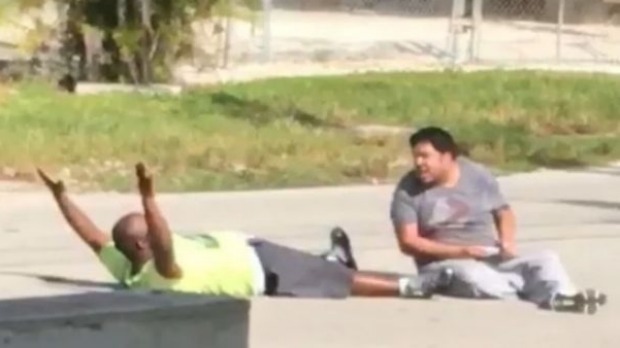 While North Miami cops shot Kinsey on Monday, many Americans were still struggling to make sense out of this incredible breach of judgment yesterday. Yet I saw no rowdy protests, no political leaders racing to Kinsey’s bed for photo-ops. I suppose the fact that police had merely shot the man in his leg but somehow failed to kill him reduced the horror of the moment. Yet I also suspect that we are growing increasingly used to many (though hardly all) police officers, sworn to protect and serve, occupying the streets as an army, shooting first and asking questions later. We are becoming far too familiar with these surreal scenes, coming to accept that a significant portion of our nation has lost its moorings. I can be forgiven, I hope, in finding a strange parallel to the fact that Republicans officially nominated Donald Trump as their standard-bearer the day after Kinsey was nearly murdered in the streets. And of course his party rallied for a fire and brimstone oration last night that featured the sorts of dog whistle rhetoric that unites the contemporary GOP. Mockery of “political correctness,” castigation of immigrants, and a Nixonian pledge for “law and order” repeated four times in 76 minutes. Trump envisioned an America that is plunging over an abyss, shouting for more than an hour and promising that, “I am your voice.” What’s most disturbing about the speech is that he’s not entirely wrong; he’s just diagnosing the wrong problem. Too many Americans have adopted Trump’s sort of authoritarian, know-nothing nativism. Too many Americans are willing to look upon the world as being filled only with threats to shoot rather than problems to solve. And too many Americans are willing to tolerate the nominee of a major political party whose lies and distortions are putting a generation of fact-checkers’ children through college. Hell, I was too. 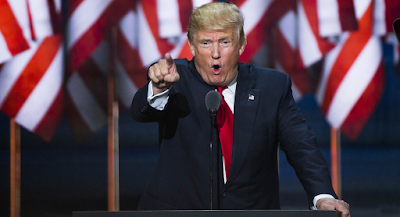 Last night I watched Trump’s speech with a sort of detached amazement, but also an acceptance that is frightening in retrospect. 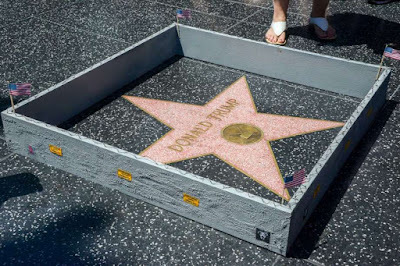 I anticipated the extent of his self-aggrandizement, I recognized the implications of his scapegoating, and I marveled at the shamelessness of his demagoguery. Yet, as was the case when I first saw the footage of Charles Kinsey begging police not to shoot him before being shot, I found myself less shocked and angry than battered and bemused. Only this morning when some of my friends took to Facebook to say, “Can you believe that Republicans chose this guy?” - only then did I remember: Oh yeah, this isn’t some televised spectacle; this is happening in my country. And so far I haven’t done much to stop it. Certainly Jenny and I gave to the Sanders campaign, we planted our Sanders yard sign and festooned our Prius with a Sanders bumper sticker. And, yes, we will support the Clinton campaign, despite that candidate’s many, many flaws. In what passes for democracy, we can make these humble contributions. Still, I remember one more surreal moment amid a circus of shocking images: Talk show host Laura Ingraham wrapping up her screed against GOP holdouts who haven’t yet committed to Trump (and against wearers of skinny jeans and man buns, for some reason) with a stiff-armed salute that evoked Nazism. 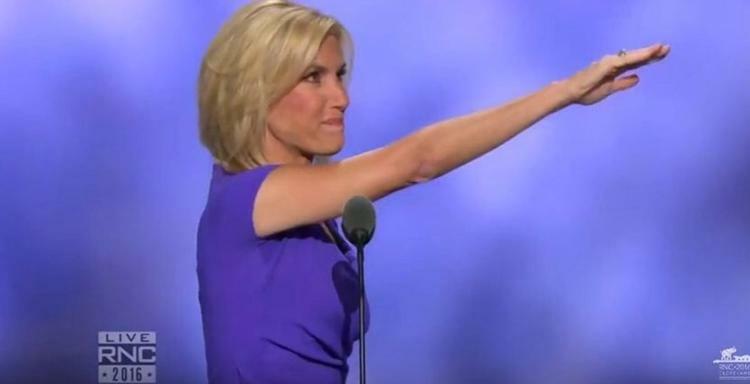 Certainly Ingraham had the good sense to recognize her error as she awkwardly rotated through a series of other nonverbal tributes, as if a Nazi salute, even a mistaken one, is just one more of those things we’ve come to accept in today’s America. And she’s been rightly mocked for her cluelessness. But the larger point remains: This country isn’t auditioning for some odious reality show, some fast food pleasure to be passively consumed and excreted in guilty solitude. A large number of our people are waving signs, hoisting placards, and pledging their commitment, not to a clown but to a genuine threat to our country. Those of us who must stop him must not stoop to his tactics, or the vile bullying employed by some of the thugs who support him. But we must also no longer watch this trainwreck as detached observers. Peacefully but persistently we must stop this locomotive before it takes us all over the cliff. A slightly drizzly day in Paris is still, well, a day in Paris. 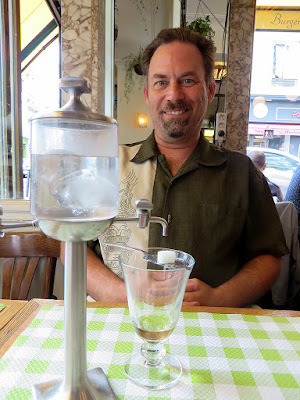 After our early afternoon nap we headed out to chase the Green Fairy at La Fée Verte. Jenny, of course, abstained from absinthe but kept a close eye as I started feeling that my ear was hanging a bit too low. 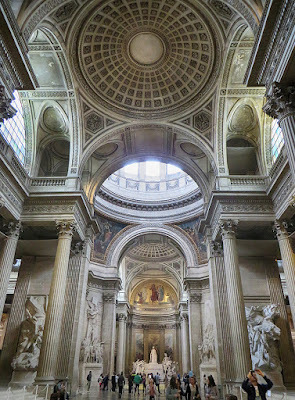 We then ducked into a pastry shop for some macarons and meringue, which we carried for a leisurely stroll to the metro that, following lots of twists and turns, brought us to the Panthéon, where we communed with Voltaire and Rousseau. Then we headed to Jardin Du Luxembourg for an early evening concert of Chopin. Dinner was light, a selection of appetizers and cocktails at Georgette (again, Jenny opted for hot chocolate instead of what is arguably the best Manhattan I’ve ever enjoyed). Now we’re back in our little hotel room, plotting tomorrow’s adventures in la Ville Lumière.